Wide eyed, passionate and ready to join the fight for equal rights and justice in the world, is perhaps a good way to describe the newest cohort of international development students at Centennial College, Progress Campus. Though small, the group of eleven were more than enthused to put pen to paper and write to government officials around the world on behalf of the oppressed and marginalized. 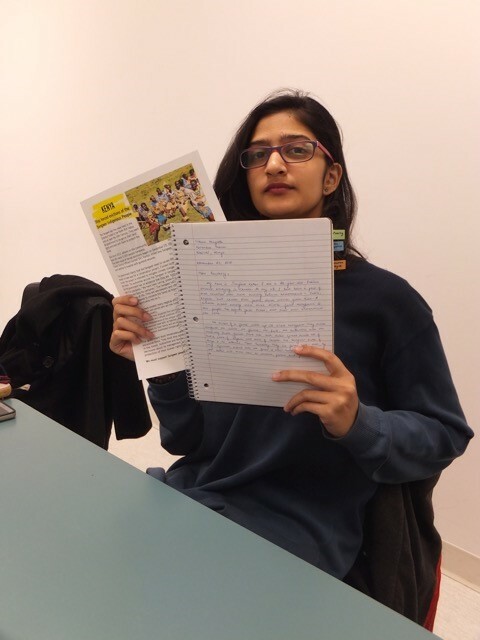 Marilyn McKim of Amnesty International Canada visited the group during their weekly Human Rights and Development class in November 2018 to speak about Amnesty International's advocacy work and the Write for Rights campaign. 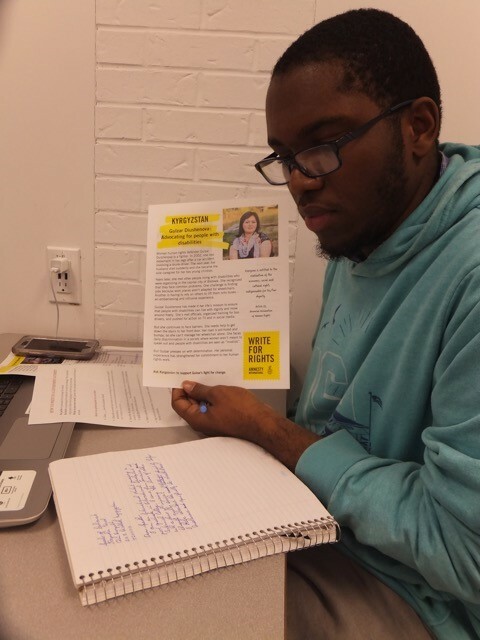 After explaining the history of how Amnesty International was formed and the concept of the Write for Rights campaign, there was no shortage of willingness among the group to take up the challenge. Amnesty International's Write for Rights campaign is a global letter-writing campaign and the world’s largest human rights event. Millions of letters are written each year in support of persons around the world suffering grave human rights abuses. These letters are written by average people like me and the other students at Centennial College, so virtually anyone with a desire to do so can get involved. Last year the campaign recorded 5 million letters. Perhaps the target for this year is 6 million. What's more, the campaign this year is all about writing for the rights of millions of women around the world fighting for their rights and the rights of their communities. It is often said that the pen is mightier than the sword. So with swords in hand, the students gallantly inked their concerns on paper urging officials to end the oppression and marginalization of women around the world. Some of the cases included women fighting to defend their rights to their land, women advocating for the rights of women of colour, women facing refoulement, disabled women and so on. The group also had the opportunity to send letters of encouragement and solidarity to the women on whose behalf they wrote. The International Development programme at Centennial College has a heavy focus on poverty reduction, development and human rights and prepares students to play an active role in tackling developmental challenges around the world. Amnesty International's Write for Rights event was the perfect introduction to global advocacy for the students. Words are indeed powerful and every voice counts. To find out how you can get involved in the Write for Rights campaign visit www.writeathon.ca.